I'm going to cut an paste the Minyanville version to replace it... thank goodness for back ups! If all my talk of waves and wave degrees leaves you confused, please bear with me. Sometime in the next few days I’ll publish an update that explains how my go-to targeting and prediction system (Elliott Wave Theory) works. For now, I’ll try to keep things as simple as possible. 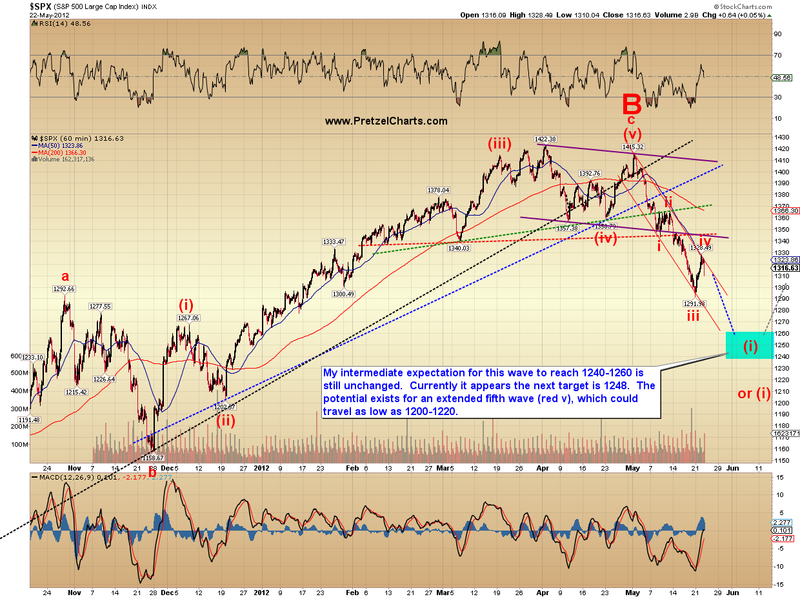 Yesterday's rally exceeded my target zone by 2 points, and has necessitated a slight shift in the wave degrees. This leaves an interesting situation where red wave i and red wave iii are nearly equal lengths – and this type of behavior commonly precedes a bearish extended fifth wave. That means that while the target zone of 1240-1260 for the S&P 500 (SPY) remains unchanged, the potential exists for a fast drop down into the low 1200's. 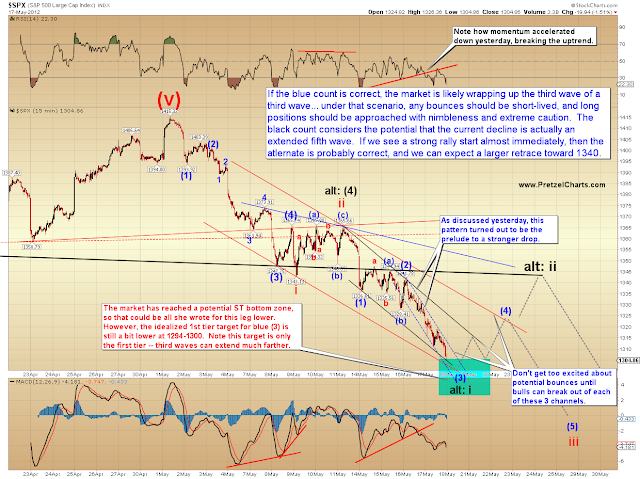 In other words, things may be even a bit more bearish than previously anticipated. We'll have to see how the wave unfolds to confirm or deny this expectation. The first chart is reprinted from the May 18 update (SEE: SPX Update: 81 Points of Profit Captured as Market Hopes for a Facebook Bounce). We can see that the preferred wave count (in blue) had a target of 1294-1300, and then expected a bounce into the mid-1320’s. This is exactly what happened. Try doing that with fundamental analysis! The next chart is the updated version of the chart above, with the current price action filled in. It also reflects the aforementioned labeling shift in wave degrees (from blue (3) to red iii). 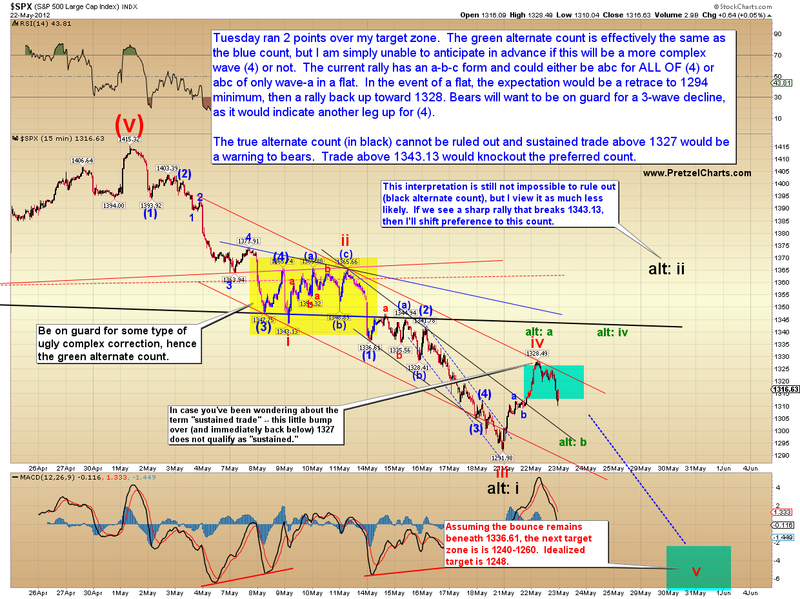 The rally has now formed a clear a-b-c structure, and it has probably topped at Tuesday's 1328 print high. As I've said before, though, 4th waves are known to string several fractals together, so another down/up sequence can't be ruled out (or anticipated -- it either happens or it doesn't). The intermediate outlook is unchanged -- with the exception of the additional more bearish potential of an extended fifth wave decline to the low 1200's. 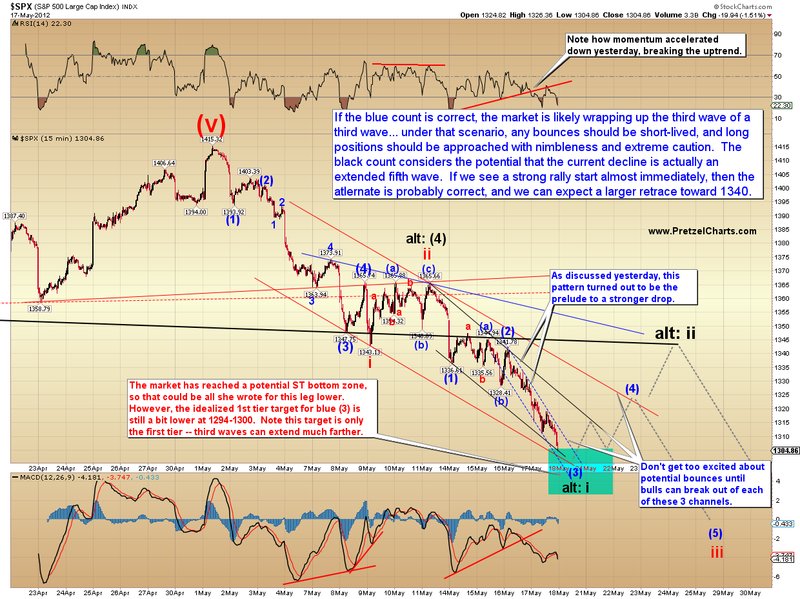 In conclusion, outside of the new, more bearish possibility, there's really not a whole lot to add. Things have, so far, played out almost perfectly in line with the updates and targets. It remains my belief that we have seen an important and major trend change at the spring highs, and that this decline is only the first wave down of many more to come. Trade safe. I registered today using a different email address than my original one, for some reason. Dear Disqus, I can't believe I would ever say this, but I miss you. I have to admit that I like it too Dave, much more than the forum format. But I fully respect what Pretzel is doing and am pretty confident he has his reasons. So I'm quickly learning how to use the forum even though I don't really care for it much. We'll get used to it and I admit that I like it much better today than I did Monday. Hang in there buddy. I'll get used to it and I completely understand why PL is making the change... the contributors like youself are great and we don't want that to change because of trolls! Hopefully, by next week, I won't miss a beat when visiting the forum. I got blocked yesterday probably by the spam blocker. I don't generally post but enjoy reading the posts but more so the articles. I know my server at work does not have a certification which probaly caused some of the problem. I did however donate money and hoped to enjoy as I have in the past. I registered on the new board as Count_Alternate. I think that I probably only have a half-dozen or so posts here starting around last November (all fairly benign, I think). I never created a Disqus ID, this "sch" ID is via the Yahoo! login option, but if Yahoo! passed the e-mail address(es) to Disqus, the Yahoo! profile primary e-mail should be the same as the one I used when registering as Count_Alternate. Incidentally, I probably should have chosen a more descriptive ID such as "Long and Red" or "Buying High/Selling Low". ~ RayierNever registered on this board but figured it was a good chance to register at your link. Maybe I need to try registering from home rather than at work? Hello PL.....quickly posting here cuz I'm really pressed for time. But had to ask if 1165 is in the cards, if fifth wave within 3 is extended. Chart attached. I've labeled it "trap door" I'll try to catch up later tonight. What the hell, so yet another one is going private. Jeez, that only leaves a few left. Been busy earning my paycheck... looks like things have changed a bit. Jason I registered with the name "MaxMallan". Believe me, I wish I didn't feel this was the only solution. btw, it's only the forum going private. And it's an "open" private forum, lol. Hello, been following for several months, love the articles and the banter. Have only posted once or twice in the past, registered as Waterbuoy. Registered as richt145. Posted once a few months ago as richt145, before the format change I think. Thank you for approving. I enjoy reading the comments as much as your updates. Cheers. Registered as lanamak or gazelle or rbaselt, depending on what service I signed up with. Have posted several times, esp. to katzo. Willing to supply you with any details you need to maintain my access, I enjoy this site a lot and depend on your viewsin my daily trading. Hi Randall, I *do* have record of you posting here before. You signed up at www.deepwaveanalytics.com? Please tell me what your new username is. Sorry, you got the wrong guy...What would make you think I was BB?